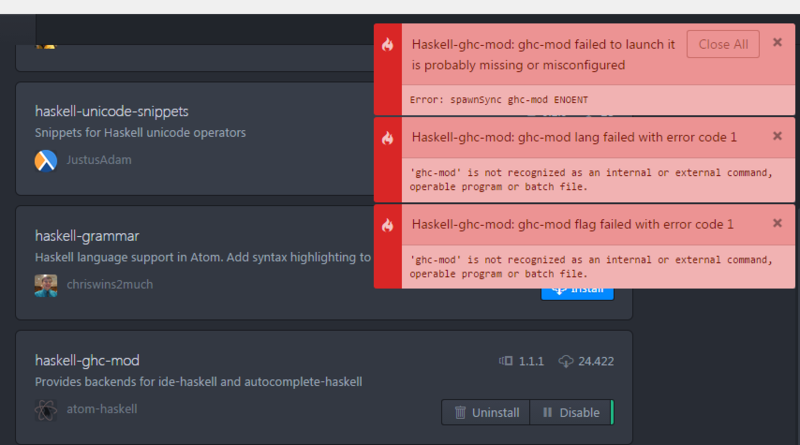 I wanted to see how easy it would be to install the recommended Haskell plugins on Atom, using Stack. npm ERR! argv "C:\\Users\\blauwers\\AppData\\Local\\atom\\app-1.1.0\\resources\\app\\apm\\bin\\node.exe" "C:\\Users\\blauwers\\AppData\\Local\\atom\\app-1.1.0\\resources\\app\\apm\\node_modules\\npm\\bin\\npm-cli.js" "--globalconfig" "C:\\Users\\blauwers\\.atom\\.apm\\.apmrc" "--userconfig" "C:\\Users\\blauwers\\.atom\\.apmrc" "install" "C:\\Users\\blauwers\\AppData\\Local\\Temp\\d-115106-7516-1e496pn\\package.tgz" "--target=0.30.7" "--arch=ia32" "--msvs_version=2012"
npm ERR! Failed at the language-haskell@1.4.12 postinstall script 'coffee src/haskell.coffee'. Woo. Okay, let’s try via Atom itself. You need to have ghc-mod, ghc-modi (part of Ghc-Mod) and hlint executables installed on your system. ghc-mod needs to be able to find hlint (eiter add hlint directory to PATH, or install both in the same cabal sandbox). Looks good! 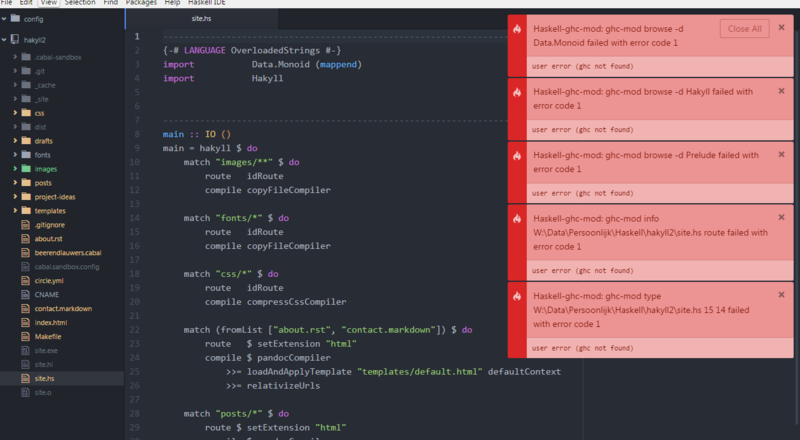 Atom still gives me those error messages, though, so let’s restart. I loaded up the code branch of the repository that generates this website in Atom as a project. After selecting site.hs, I get… Not much. A message that tells me the editor isn’t responding. There can be some problems with ghc-modi upstream, most notably, it does not work on paths with whitespace. None of the bin folders of the GHC’s there are in my path, so more path pollution is in order! I think the best course of action is to nuke it all and start with a more recent version of ghc-mod, seeing as Stack support was only introduced in 5.4. I’ll revisit this another time.